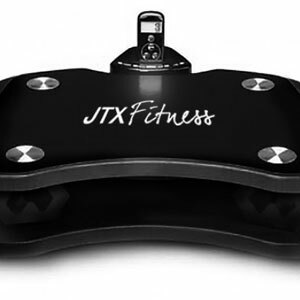 What are the Pros and Cons to this JTX Fitness Plate? The JTX SLIM-FIT Home Vibration Plate has the benefit of power, but isn’t too intimidating despite this. This vibroplate is a tri-plane model for a high intensity approach. There are three workout programmes and 4 speed settings for variety. It says handless, in that there is nothing to hold onto. However, there are straps included to help tone the arms and give the hands something to do. Users recommend that newcomers start slowly and work their way up to better fitness levels. The additional DVD will help. This is a small wobble machine that doesn’t look like much on first impressions, but it is actually quite tough and reliable. The small size, for that “handless design”, means that it is a portable model for the home. This is aided by the addition of transport wheels to get it in the best position. It weighs 20kg, so is not light and flimsy at all, and has a good maximum user weight allowance of 120kg. 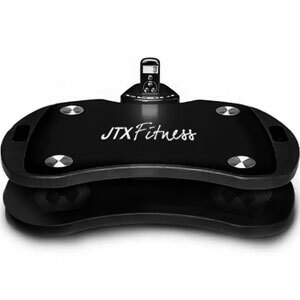 The problem with this JTX Fitness Vibration System is that is may not be the simple, quick fix that some people are after. There is some great support and information to be found within the workout guides for this system, which leads to a lot of great feedback. However, some do feel that could have done with a few more instructions to help them to put it together. This isn’t a common complaint, but some need say that it was a bit fiddly. The positive here is that it does highlight the complexity of the machine and there is mixed reaction to the results seen. There are some that have no complaints because they appreciate the slow road that they are on. Others expected a little more when it came to noticeable physical changes in tone and weight. It is all a matter of perspective. Those that expect the fat and cellulite to melt away in weeks will be disappointed. Summary what does this mean for the final verdict on this JTX SLIM-FIT Home? There are many more pros than there are cons to this vibration machine, and a lot for users to gain as long as they maintain the right attitude to the product. This vibroplate has a great design with the strong base and wheels. But, it doesn’t compromise on strength and power in the process. The upgrade to the motion and tri-plate movement appears to be a positive one, even if some users are still keen to criticise the speed of the results. Overall, the JTX vibration plate is definitely recommendable to all those that want a slow and steady route to toning from a reliable machine. Find more reviews about the JTX Slim-Fit Home Vibration Plate on JTX Fitness here.